Learn to paint with Donna Dewberry, star of "One-Stroke Painting" and one of television's most admired painting teachers. 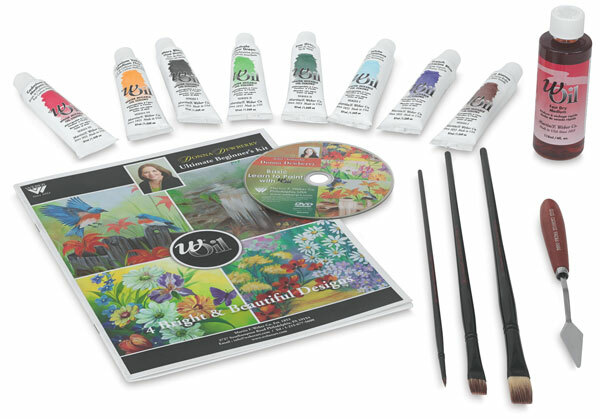 Donna Dewberry wOil Sets contain everything you need to start creating beautiful floral and foliage designs using her fun and easy method. Both sets contain non-toxic, water mixable Weber wOil Artist Oil Colors, which are safe for home and classroom use and do not require harsh solvents for cleanup. Basic Set — The Basic Set contains eight 37 ml oil colors (Permanent White, Cadmium Yellow Medium Hue, Sap Green, French Ultramarine Blue, Cadmium Red Medium Hue, Phthalo Yellow Green, Mars Black, and Burnt Sienna), a 118 ml bottle of wOil Fast Dry Medium, three wOil brushes (Size 0 Perfect Round, Size 6 Perfect Bright, and Size 8 Perfect Flat), a diamond edge painting knife, and Donna's instructional booklet, Dewberry Basic Learn to Paint with accompanying DVD. Floral Set — The Floral Set contains eight 37 ml oil colors (Permanent White, Cadmium Yellow Medium Hue, Sap Green, Alizarin Crimson Permanent, Cadmium Red Medium Hue, Phthalo Yellow Green, Mars Black, and Raw Sienna), a 118 ml bottle of wOil Fast Dry Medium, three wOil brushes (Size 0 Perfect Round, Size 6 Perfect Bright, and Size 8 Perfect Flat), a diamond edge painting knife, and Donna's instructional booklet, Dewberry Basic Learn to Paint with accompanying DVD. ® wOil is a registered trademark.